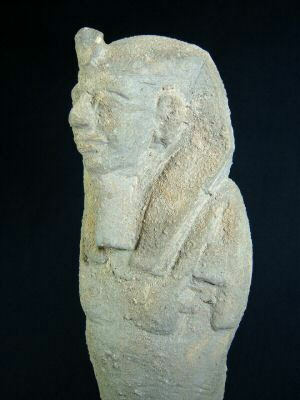 Ancient Egyptian "Stone Carved Ushabti"
The above listed item is from the Late Period,(715-332 B.C.E. ), 26th Dynasty as a guideline. This rare ushabti was carved from stone. We acquired this lovely item from a select private collection and its provenance is from Alexandria, Egypt. Depicted is a royal or noble ushabti in Nemes headdress with Uraeus. It has a large Eye of Horus, a Late Period cartouche and other visible hieroglyphics. The piece is intact with age wear. The reason for the item being available is due to the vast extent of archeological findings, thousands of years in Egyptian burials and also the proliferation of these said items in older private collections worldwide. Ushabtis are one of the most popular Egyptian collectibles, they are a good investment, long lasting and a true example of the Egyptian funerary culture.The timeline on our items is a suggestive guideline for the listed Egyptian Period.